Selenium is a open source ( Free !!! ) tool for function/regression, unit testing the web application. It has a IDE which is actually a firefox add-ons which lets you record/playback the events and it also lets you export your test cases into the other desired ( Java, php, .net, ruby ) language for further editing. It has three main component provided by selenium and other optional provided by third party. ANT: This is the reporting tool. The first three of the above are main components others are optional but essential. Selenium IDE will be installed automatically if you have use firefox to download it else a .xpi file would have been downloaded. Just drad and drop the file on the firefox and it will be installed. Extract the Selenium Core, Selenium RC and Junit in your desired directory. Now after this you need to set the path and classpath environment variables. set path=%classpath%;full path of ""selenium-java-client-driver.jar"
Find out the Junit-4.6jar ( file name may differ depends on the version you have downloaded) and set it full path in the classpath variable. Find out the bin located inside the Java folder and set its path in the path variable. Now you can start recording. Navigate to the Google.com and in the search box enter "Selenium IDE" or any other text. Now click on the first text present. 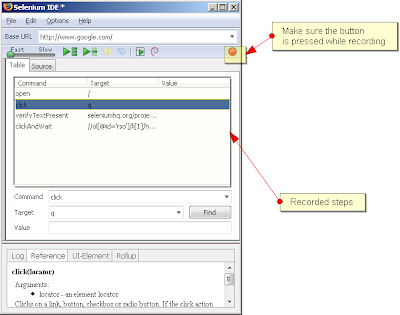 Now go back to the IDE you will find the recorded steps in there. You need to change all the "click" command with "clickandWait". and now you can playback to see whether the recorded test cases passes or not. Just click on the green arrow button and the testcase will be loaded in browser and will be executed. I have done all the steps mentioned above but I can not see JAVA RC in file>export Test cases>. I can see , Junit RC, JAVA TestNG and other options, but not Java. Have i missed any step. No you are right. With newer version of selenium IDE they provides the facility to export Testcase in JAVA (TestNG) or Java (Junit). I really find your blogs very useful to me. since im starting using selelium for testing test cases. i just want to ask if there is any better reporting tool that can be use with selenium IDE? I don't know if there is any reporting tool for selenium IDE. But if you are planning to upgrade to selenium rc you can use TesNG which provides good results, you can also user ReportNG which is a extension of TestNG which gives somewhat more improved results. now i install selenium RC on my machine. and i find it useful. what do i need for me to use a TestNG or reportNG. if you dont mind i just want to ask for your ym? is it ok. hehe. Check out the other posts on TestNG in this blog. You will fine it useful. Could you please explain the step where you set the full classpath for selenium java client driver. Where do we need to make this setting? can the selenium be run without any IDE like bromine, eclipse, testng. I plan to use python for scripting the tests. I have followed all the steps till the initiating the selenium server. How do i proceed thereafter?